I love making crostini for parties because they’re easy to eat without utensils and are fun to customize with endless topping combinations. This recipe, which features ingredients entirely from ALDI, covers all your texture and flavor bases for a delicious bite: crunchy, creamy, crispy, sweet, salty, tangy, and peppery. 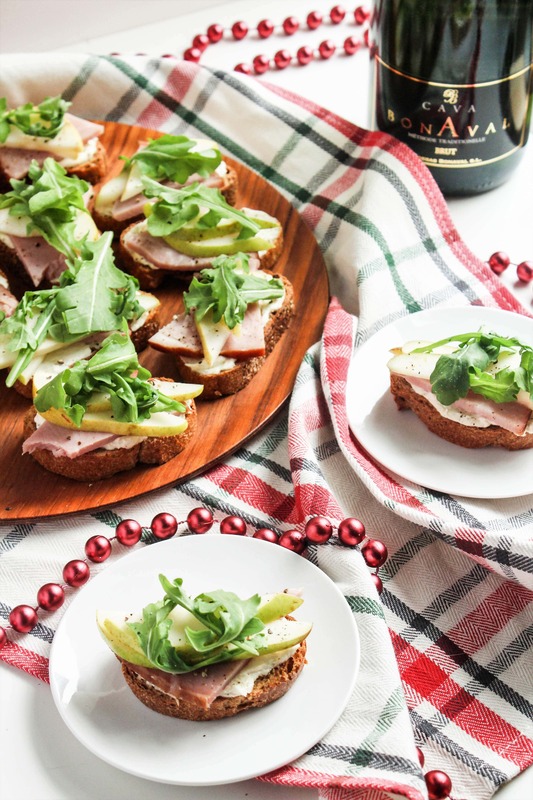 The salty, smoky flavor of spiral sliced ham always reminds me of the holidays, and when paired with the tanginess of cream cheese and goat cheese, the sweetness of pears, and the spiciness of arugula, this recipe is a hit! Have you guys been to an ALDI before? (If not, here’s the ALDI store locator to find one near you!) It’s a grocery store that believes that you shouldn’t have to spend a lot of money to enjoy high quality food. 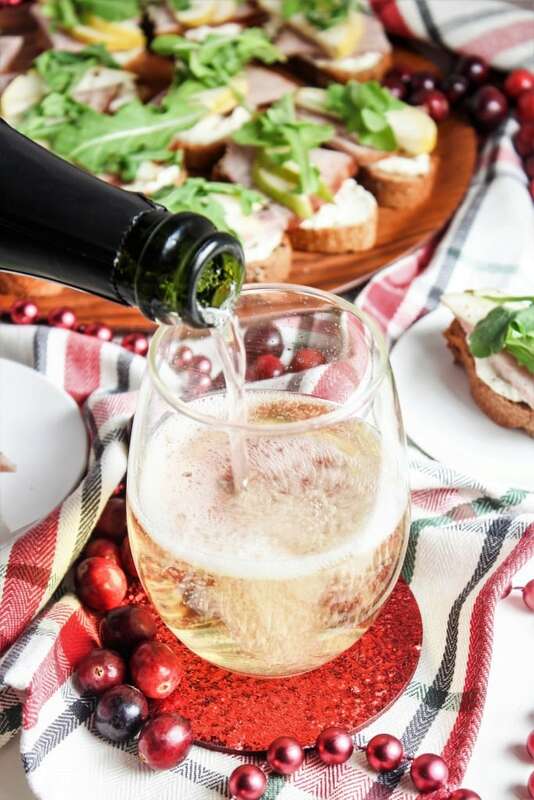 I was first introduced to ALDI at Blog Brulee, the RD blogger workshop I’ve spoken at previously; they were the wine sponsor for the event one year and we were all so impressed with how delicious and affordable their wine was! I’ve since learned they also have a lot of great food, including affordable organic options. 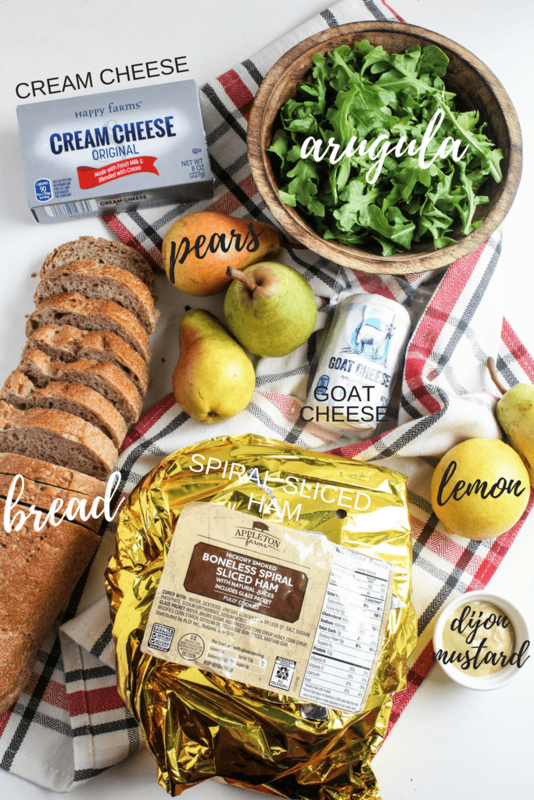 To throw this recipe together, just bake the baguette rounds until crispy (which can be done in advance), spread with the cream cheese/goat cheese mixture, and top with ham, pear, and arugula. That’s it! 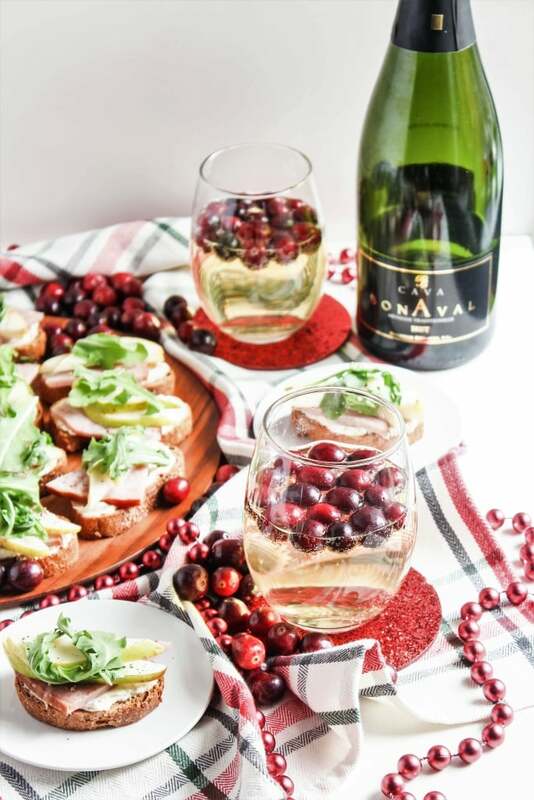 I picked up a bottle of ALDI’s Bonaval Cava Brut to serve with these crostini (I’m SO excited to be able to drink Cava again!) and the pairing is perfect. 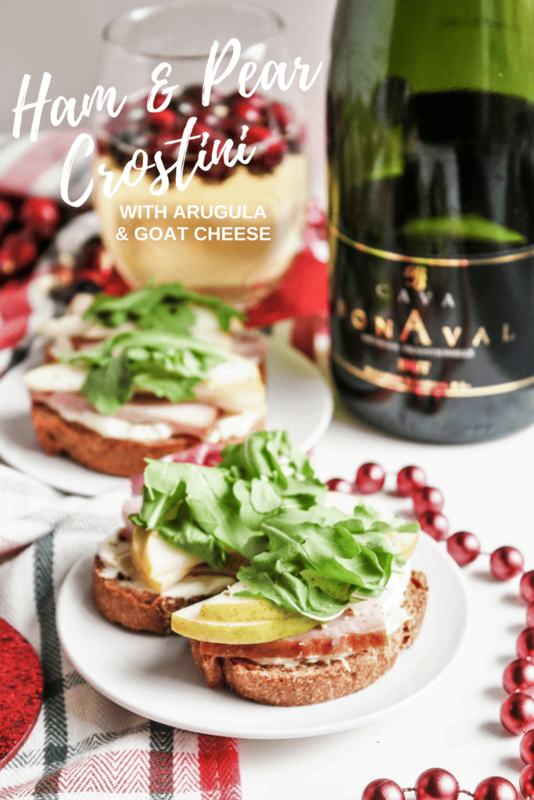 The bold, balanced flavors of the crostini are great with the light and refreshing Cava – I’d definitely recommend picking up a bottle! This wine was awarded 89 points by the Beverage Testing Institute, and received a Silver medal as a Best Buy and Highly Recommended wine. It pairs especially well with anything involving creamy cheese. I whipped out one of my favorite holiday season tricks for this Cava: using frozen cranberries to keep the drinks cold! 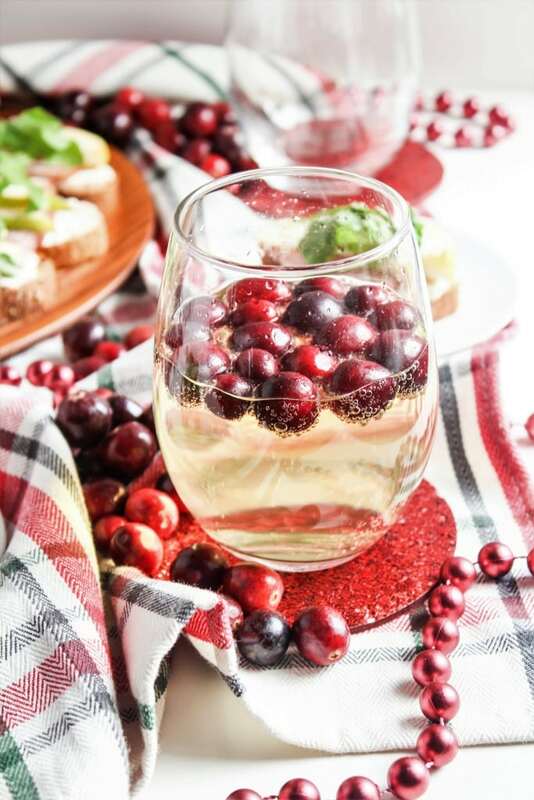 Rather than watering down a delicious glass of bubbly with ice, toss in some frozen cranberries instead. It looks quite festive, too, which is a nice bonus – give it a shot! And now, on to the full recipe. Enjoy! 2. 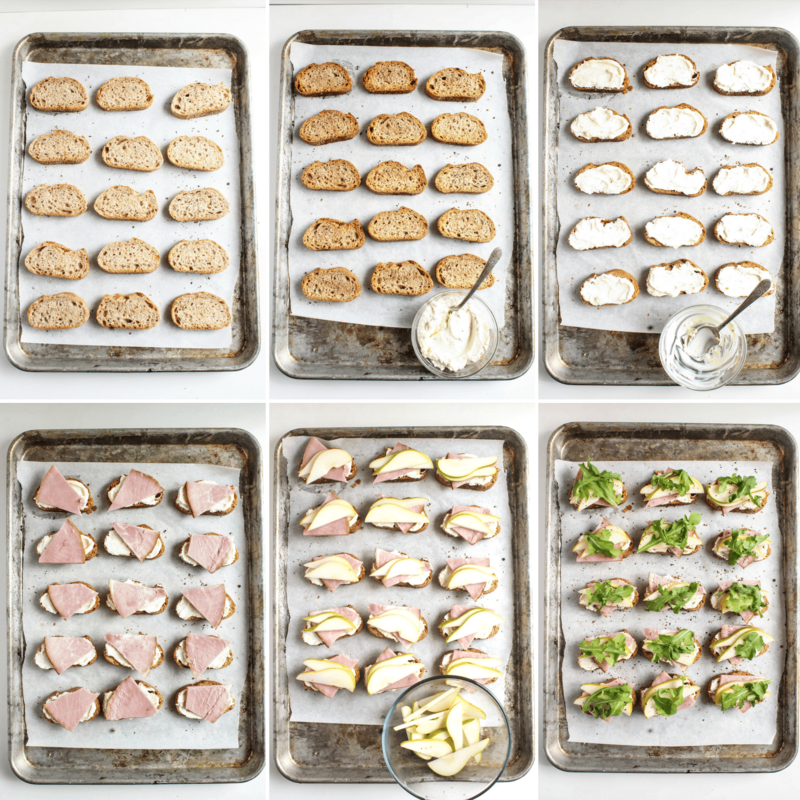 Place baguette slices on a baking sheet in a single layer. Drizzle lightly with olive oil and sprinkle with salt and pepper. Bake until crisp and golden, about 15 minutes. 3. Meanwhile, mix cream cheese, goat cheese, Dijon mustard, lemon zest, lemon juice, and a pinch of salt and pepper in a bowl until smooth. 4. Spread cream cheese mixture evenly onto toasted baguette slices. 5. 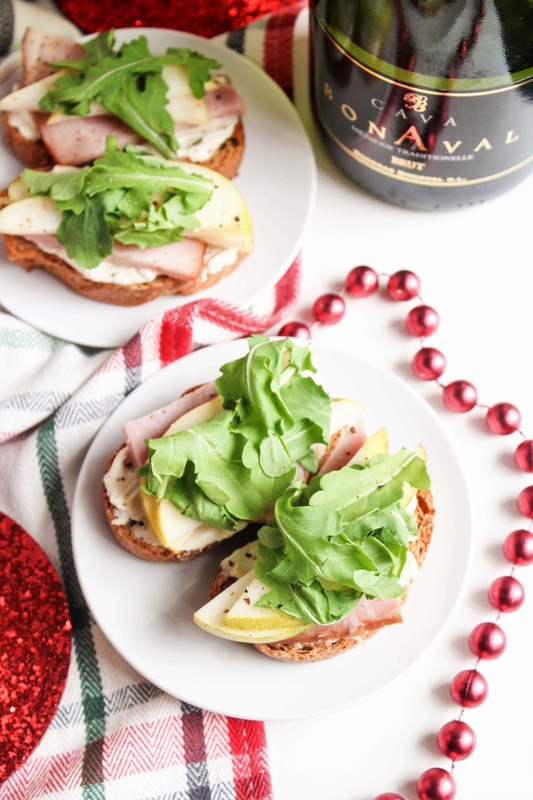 Top each baguette slice with a piece of ham, then 2 thin slices of pear, then a few leaves of arugula. Sprinkle with pepper. 6. 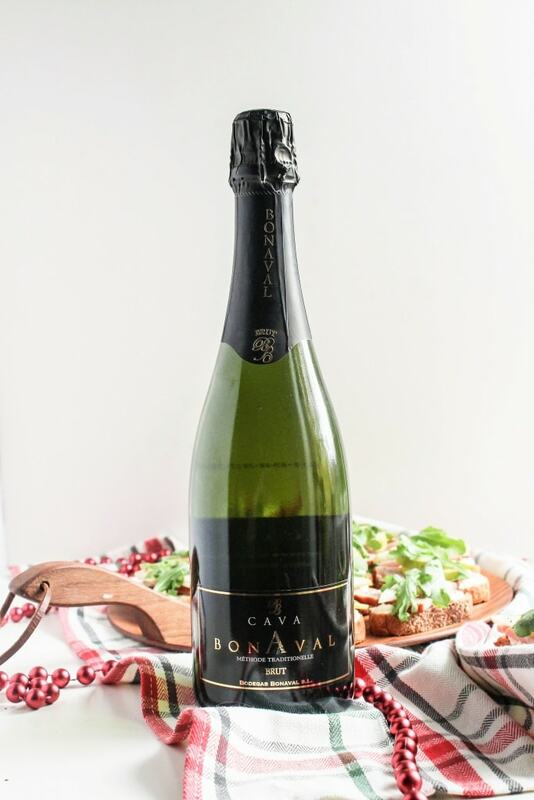 Enjoy alongside Bonaval Cava Brut! Thank you to ALDI for sponsoring this post! Check ALDI out on Facebook, Pinterest, Twitter, and Instagram for more affordable holiday recipe inspiration! What’s on the menu for your next holiday gathering? Next article: 3 Weeks Old! This is so perfect!! I plan to make these or a delicious salad with all of these component with our leftover Christmas ham that I did buy at Aldi. We LOVE Aldi, and their goat cheese is excellent. Beautiful photos! This all looks awesome! Thanks! Three things: 1) I was going to ask you where an ALDI was located near us, but then I just clicked on the store locator instead. Thank you for including that! 2) Your pictures are looking especially beautiful today. 3) Now that I don’t get to see you twice a week, I am a much more active blog reader. I think I’ve clicked on every post since Reise was born. You’re welcome for helping to increase your stats. :) Miss you! Yum! This looks like an easy to make appetizer that looks like it’s more work than it is. Thanks for sharing this one. It’s definitely quick and easy! Oh that looks scrumptious!!! We love aldi too but wish they had wine at ours!!! This is the perfect new years eve app! Can’t wait til I can drink some bub again. I didn’t even think about this for a NYE party – you’re right! Would be perfect!! Yum! the perfect New Years Appetizer!